Low-noise and low-power extract axial fan with air capacity up to 155 m³/h. Mounting into ventilation shafts or connection to Ø 100, 125 mm. Permanent or intermittent extract ventilation of shower rooms, bathrooms, kitchens and other residential premises. 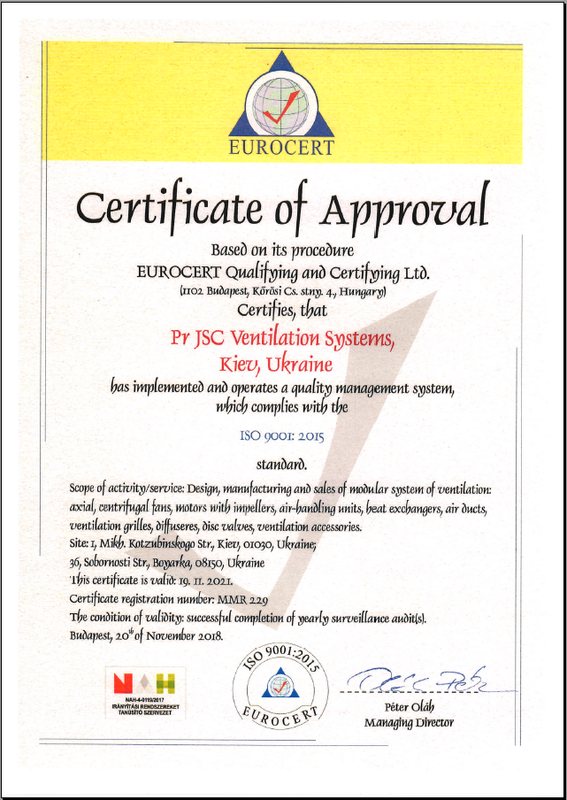 Ventilation of premises with high requirements to noise level. Mounting into ventilation shafts or connection to Ø 100, 125 mm. Modern design and aesthetic look. The casing, the impeller and the front panel are made of high-quality and durable UV-resistant plastic. The specially designed aerodynamic profile of the mixed-flow impeller provides high air capacity and pressure combined with low-noise operation. The fan is equipped with a specially designed backdraft damper to prevent back flow and heat losses during the fan standby. The fan exhaust spigot incorporates specially designed air rectifiers to reduce air turbulence, noise level and boost air pressure. Reliable motor with low energy demand. Rated for continuous operation and is completely maintenance-free. Control with the electronic control unit BU-1-60. The control unit is supplied separately. Control with the turn-off delay timer T. The built-in turn-off delay timer enables operation of the fan within 2 up to 30 minutes after turning the fan off with a switch. Control with the timer T1. After turning of the external switch the turn-on delay timer is activated for 10 seconds up to 2 minutes. The fan remains turned off. After the fan is turned off with the external switch the fan keeps running within 2 up to 30 minutes according to the settings of the turn-off delay timer. Control with the timer and humidity sensor TH. If the indoor humidity exceeds the set humidity point adjustable from 60% to 90%, the fan switches automatically on and runs until the indoor humidity drops below the set humidity point. After that the fan continues running according to the timer settings and turns off. Manual operation with a room light switch (not included in the delivery set). Operation with a built-in pull cord switch V. Not applicable in case of the ceiling mounting. Direct installation inside a ventilation shaft. Flexible air ducts may be used in case of remote location of the ventilation shaft. The air duct is connected to the exhaust spigot with a fixing clamp. Solid L Modification with a ball bearing motor for long service life (around 40 000 operating hours). Installation at any angle is possible. The ball bearings require no maintenance and are greased for the entire service life. Solid T Modification with a regulated turn-on delay timer. Solid T1 Modification with a turn-on delay timer regulated from 10 seconds to 2 minutes and a turn-off delay timer regulated from 2 up to 30 minutes. Solid TH Modification with a turn-off delay timer regulated from 2 up to 30 minutes and a humidity sensor regulated from 60% up to 90%. Solid V Modification with a pull-cord switch. Solid VT Modification with a pull-cord switch and a turn-off delay timer regulated from 2 up to 30 minutes. Solid VTH Modification with a pull cord switch, turn-off delay timer regulated from 2 up to 30 minutes and a humidity sensor regulated from 60% up to 90%.